Objectives: The workshop invites artists, architects and designers for a creative exploration of incremental urban development in radically different contexts. It aims at altering the discourse on places. By encouraging a play of the familiar and the fantastic, it is simultaneously sensitive and irreverent to contexts. It promotes incremental building practices, while allowing genuinely creative and free interventions, unburdened by limited speculative notions of the future and modern planning ideology. 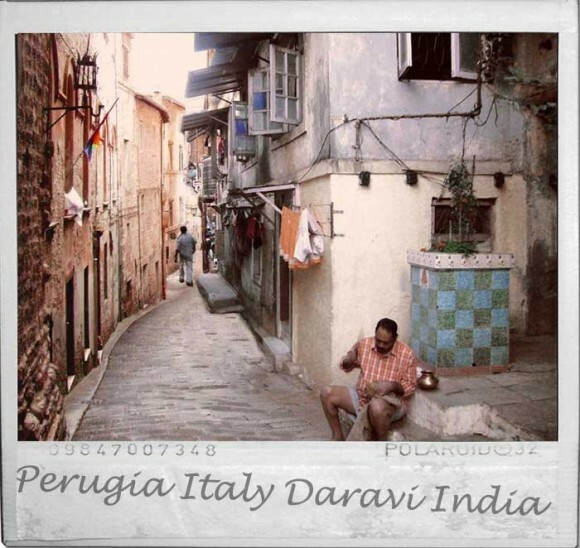 Workshop participants will mashup images of Perugia and other cities together with images of Dharavi using their own laptops and image editing software. Images of Dharavi will be provided. Participants are required to bring images of their own cities and neighbourhoods. The focus is on streetscapes and architecture but people and objects can also be included. Rational: The Mashup workshop uncovers the common hidden dynamics at work in radically different urban contexts. By merging together streetscapes and architectures from Mumbai, Perugia and beyond, the workshop rehabilitates neighbourhoods whose urban forms are typically misunderstood and mistreated by urban practitioners, such as Dharavi, a large unplanned and self-developed settlement in the heart of Mumbai. The history of incremental development connects urban contexts that everything else seems to set apart. Who would imagine that neighbourhoods in Japan or Italy could be compared to those in Mumbai? The incremental growth of cities is the default form of urban development all over the world, especially when there is no grand master plan imposed. Some of the most glorified cities and neighbourhoods have emerged from this process. Yet, it is dismissed in cities like Mumbai where the urban development is dominated by speculative interests and narratives of a world-class and master-planned city. Exhibition: A selection of the mashed-up images will be exhibited at the festival on Sunday 5th and then uploaded on the Abitare and urbz.net websites. Registration: Participants should apply before June 1st. To register send a short bio and a brief explanation of why you are interested in participating in the workshop via the contact page. Participants should bring their own laptops. Attendance is limited to 25 participants. A series of collages juxtapose Dharavi's landscape with other international scenarios to question if Dharavi's context is actually omnipresent. This seminar explores the shadow history of Tokyo's rise as the largest and the wealthiest agglomeration in the world.